When you are searching for a midsize sedan that was built to keep the driver safer on the road, you need to get a look at the all-new Toyota Camry. Here are some of those safety features. 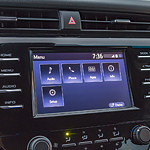 One safety feature in the Toyota Camry that is keeping drivers focused on the road is the Lane Departure Alert with Steering Assist. If the vehicle drifts out of the lane, the steering wheel vibrates to get the driver to take action, and steering assist nudges the car back into the lane to help. The Pre-Collision System with Brake Assist feature scans the road looking for anything that might get in the way of your vehicle and alerts the driver to take the appropriate action. If needed, additional force is applied to the brake to avoid potential trouble. We have the new Toyota Camry available at Mann Toyota so you can test drive today.